For a complete list of the first ladies, see List of First Ladies of the United States. "FLOTUS" redirects here. For the Lambchop album, see FLOTUS (album). The First Lady of the United States (FLOTUS) is the title held by the hostess of the White House, usually the wife of the President of the United States, concurrent with the President's term in office. Although the First Lady's role has never been codified or officially defined, she figures prominently in the political and social life of the nation. Since the early 20th century, the First Lady has been assisted by official staff, now known as the Office of the First Lady and headquartered in the East Wing of the White House. Melania Trump is the current First Lady of the United States, as wife of 45th president, Donald Trump. While the title was not in general use until much later, Martha Washington, the wife of George Washington, the first U.S. President (1789–1797), is considered to be the inaugural First Lady of the United States. During her lifetime, she was often referred to as "Lady Washington". There are four living former first ladies: Rosalynn Carter, wife of Jimmy Carter; Hillary Clinton, wife of Bill Clinton; Laura Bush; wife of George W Bush and Michelle Obama, wife of Barack Obama. As of 2019[update], the only former First Lady who has run for or held public office is Hillary Clinton. Dolley Madison was said to be the first President's wife to be referred to as "First Lady" (this was at her funeral in 1849). The use of the title First Lady to describe the spouse or hostess of an executive began in the United States. In the early days of the republic, there was not a generally accepted title for the wife of the president. Many early first ladies expressed their own preference for how they were addressed, including the use of such titles as "Lady", "Mrs. President" and "Mrs. Presidentress"; Martha Washington was often referred to as "Lady Washington." One of the earliest uses of the term "First Lady" was applied to her in an 1838 newspaper article that appeared in the St. Johnsbury Caledonian, the author, "Mrs. Sigourney", discussing how Martha Washington had not changed, even after her husband George became president. She wrote that "The first lady of the nation still preserved the habits of early life. Indulging in no indolence, she left the pillow at dawn, and after breakfast, retired to her chamber for an hour for the study of the scriptures and devotion". Dolley Madison was reportedly referred to as "First Lady" in 1849 at her funeral in a eulogy delivered by President Zachary Taylor; however, no written record of this eulogy exists, nor did any of the newspapers of her day refer to her by that title. Sometime after 1849, the title began being used in Washington, D.C., social circles. One of the earliest known written examples comes from November 3, 1863, diary entry of William Howard Russell, in which he referred to gossip about "the First Lady in the Land", referring to Mary Todd Lincoln. The title first gained nationwide recognition in 1877, when newspaper journalist Mary C. Ames referred to Lucy Webb Hayes as "the First Lady of the Land" while reporting on the inauguration of Rutherford B. Hayes. The frequent reporting on Lucy Hayes' activities helped spread use of the title outside Washington. A popular 1911 comedic play about Dolley Madison by playwright Charles Nirdlinger, titled The First Lady in the Land, popularized the title further. By the 1930s, it was in wide use. Use of the title later spread from the United States to other nations. When Edith Wilson took control of her husband's schedule in 1919 after he had a debilitating stroke, one Republican senator labeled her "the Presidentress who had fulfilled the dream of the suffragettes by changing her title from First Lady to Acting First Man." The wife of the Vice President of the United States is sometimes referred to as the Second Lady of the United States (SLOTUS), but this title is much less common. Several women (at least thirteen) who were not presidents' wives have served as First Lady, as when the president was a bachelor or widower, or when the wife of the president was unable to fulfill the duties of the First Lady herself. In these cases, the position has been filled by a female relative or friend of the president, such as Jefferson's daughter Martha Jefferson Randolph, Jackson's daughter-in-law Sarah Yorke Jackson and his wife's niece Emily Donelson, Taylor's daughter Mary Elizabeth Bliss, Benjamin Harrison's daughter Mary Harrison McKee, Buchanan's niece Harriet Lane, and Cleveland's sister Rose Cleveland. 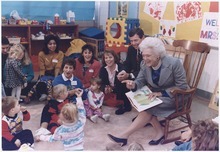 First Lady Barbara Bush, joined by Missouri Governor John Ashcroft, with a "Parents as Teachers" group at the Greater St. Louis Ferguson-Florissant School District in October 1991. Mrs. Bush, who championed literacy as first lady, is reading Brown Bear, Brown Bear to the children. Martha Washington created the role and hosted many affairs of state at the national capital (New York and Philadelphia). This socializing became known as "the Republican Court" and provided elite women with opportunities to play backstage political roles. Both Martha Washington and Abigail Adams were treated as if they were "ladies" of the British royal court. Dolley Madison popularized the First Ladyship by engaging in efforts to assist orphans and women, by dressing in elegant fashions and attracting newspaper coverage, and by risking her life to save iconic treasures during the War of 1812. Madison set the standard for the ladyship and her actions were the model for nearly every First Lady until Eleanor Roosevelt in the 1930s. Roosevelt traveled widely and spoke to many groups, often voicing personal opinions to the left of the president's. She authored a weekly newspaper column and hosted a radio show. Jacqueline Kennedy led an effort to redecorate and restore the White House. Over the course of the 20th century, it became increasingly common for first ladies to select specific causes to promote, usually ones that are not politically divisive. It is common for the First Lady to hire a staff to support these activities. Lady Bird Johnson pioneered environmental protection and beautification. Pat Nixon encouraged volunteerism and traveled extensively abroad; Betty Ford supported women's rights; Rosalynn Carter aided those with mental disabilities; Nancy Reagan founded the Just Say No drug awareness campaign; Barbara Bush promoted literacy; Hillary Clinton sought to reform the healthcare system in the U.S.; Laura Bush supported women's rights groups, and encouraged childhood literacy. Michelle Obama became identified with supporting military families and tackling childhood obesity; and Melania Trump has stated that she wants to use her position to help children, including prevention of cyberbullying and supporting children whose lives are affected by drugs. Near the end of her husband's presidency, Clinton became the first First Lady to run for political office. During the campaign, her daughter, Chelsea, took over much of the First Lady's role. Victorious, Clinton served as U.S. Senator from New York from 2001 to 2009, when she resigned in order to become President Obama's Secretary of State until 2013. Clinton was the Democratic Party nominee for President in the 2016 election, but lost to Donald Trump. First Ladies (from left to right) Nancy Reagan, Lady Bird Johnson, Hillary Clinton, Rosalynn Carter, Betty Ford, and Barbara Bush at the "National Garden Gala, A Tribute to America's First Ladies", May 11, 1994. Jacqueline Kennedy Onassis, absent due to illness, died a week after this photograph was taken. The Office of the First Lady of the United States is accountable to the First Lady for her to carry out her duties as hostess of the White House, and is also in charge of all social and ceremonial events of the White House. The First Lady has her own staff that includes a chief of staff, press secretary, White House Social Secretary, and Chief Floral Designer. The Office of the First Lady is an entity of the White House Office, a branch of the Executive Office of the President. When First Lady Hillary Clinton decided to pursue a run for Senator of New York, she set aside her duties as first lady and moved to Chappaqua, New York to establish state residency. She resumed her duties as First Lady after winning her senatorial campaign, and retained her duties as both first lady and U.S. Senator for the seventeen-day overlap before Bill Clinton's term came to an end. Established in 1912, the First Ladies Collection has been one of the most popular attractions at the Smithsonian Institution. The original exhibition opened in 1914 and was one of the first at the Smithsonian to prominently feature women. Originally focused largely on fashion, the exhibition now delves deeper into the contributions of first ladies to the presidency and American society. In 2008, "First Ladies at the Smithsonian" opened at the National Museum of American History as part of its reopening year celebration. That exhibition served as a bridge to the museum's expanded exhibition on first ladies' history that opened on November 19, 2011. "The First Ladies" explores the unofficial but important position of first lady and the ways that different women have shaped the role to make their own contributions to the presidential administrations and the nation. The exhibition features 26 dresses and more than 160 other objects, ranging from those of Martha Washington to Michelle Obama, and includes White House china, personal possessions and other objects from the Smithsonian's unique collection of first ladies' materials. Some first ladies have garnered attention for their dress and style. Jacqueline Kennedy Onassis, for instance, became a global fashion icon: her style was copied by commercial manufacturers and imitated by many young women, and she was named to the International Best Dressed List Hall of Fame in 1965. Michelle Obama has also received significant attention for her fashion choices: style writer Robin Givhan praised her in The Daily Beast, arguing that the First Lady's style has helped to enhance the public image of the office. The most recent First Lady to die was Barbara Bush (served 1989–1993), on April 17, 2018, at the age of 92. The greatest number of former First Ladies to be alive at one time was ten, during the period from June 2, 1886 to August 23, 1887, when Sarah Yorke Jackson, Priscilla Cooper Tyler, Julia Gardiner Tyler, Sarah Childress Polk, Harriet Lane, Julia Grant, Lucy Webb Hayes, Lucretia Garfield, Mary Arthur McElroy, and Rose Cleveland were all alive and the period from March 4 to June 25, 1889, when Priscilla Cooper Tyler, Julia Gardiner Tyler, Sarah Childress Polk, Harriet Lane, Julia Grant, Lucy Webb Hayes, Lucretia Garfield, Mary Arthur McElroy, Rose Cleveland, and Frances Folsom Cleveland Preston were alive. ^ a b Caroli, Betty Boyd. "First Lady: United States title". Britannica.com. Encyclopædia Britannica. Retrieved September 30, 2016. ^ "First Lady Biography: Dolley Madison". National First Ladies' Library. ^ Creeden, Sharon (1999). In Full Bloom: Tales of Women in Their Prime. August House. p. 30. ^ a b c d e f g Anthony, Carl Sferrazza (September 26, 2008). "The Role of the First Lady". America.gov. Archived from the original on May 10, 2009. Retrieved May 4, 2009. ^ Shields, David S. & Teute, Fredrika J. (2015). "The Republican Court and the Historiography of a Women's Domain in the Public Sphere". Journal of the Early Republic. 35 (2): 169–183. doi:10.1353/jer.2015.0033. ^ "Michelle Obama". The White House. Retrieved May 4, 2010. ^ Superville, Darlene (October 9, 2017). "Melania Trump Filling Out Her Agenda as First Lady". U.S. News & World Report. Associated Press. Retrieved November 8, 2017. ^ "Executive Office of the President". The White House. ^ "Hillary Clinton Makes a Historic Move". ^ "Mrs. Clinton to Be Official New Yorker". The New York Times. November 24, 1999. ^ "The Race Won, the Senator-Elect Resumes Her First Lady Duties at the White House". The New York Times. November 10, 2000. ^ "A Day of Firsts As Mrs. Clinton Takes the Oath". The New York Times. January 4, 2001. ^ Finkelstein, Sarina (April 12, 2016). "Want to Fix Wage Inequality? Start With the First Lady". Money. Retrieved February 6, 2017. ^ "The First Ladies". National Museum of American History, Smithsonian Institution. Retrieved April 4, 2012. ^ VF Staff (1965). "World's Best Dressed Women". The International Hall of Fame: Women. Vanity Fair. Archived from the original on July 12, 2013. Retrieved February 15, 2012. ^ Givhan, Robin (2012). "First Lady Fashion Fatigue". The Daily Beast. Retrieved October 30, 2014. Bailey, Tim (Spring 2013). "America's First Ladies on Twentieth-Century Issues: A Common Core Unit". History Now. 35. Curriculum unit based on primary sources. Berkin, Carol, ed. (Spring 2013). "America's First Ladies". History Now. 35. Popular essays by scholars. Böck, Magdalena (2009). The Role of First Ladies: A Comparison Between the US and Europe (eBook ed.). Munich: GRIN Verlag. ISBN 9783640421534. Brower, Kate Andersen (2016). First Women: The Grace and Power of America's Modern First Ladies. New York: Harper. ISBN 978-0062439659. Deppisch, Ludwig M. (2015). The Health of the First Ladies: Medical Histories from Martha Washington to Michelle Obama. McFarland. Lugo-Lugo, Carmen R. & Bloodsworth-Lugo, Mary K. (2011). "Bare Biceps and American (In) Security: Post-9/11 Constructions of Safe(ty), Threat, and the First Black First Lady". Women's Studies Quarterly. 39 (1): 200–217. doi:10.1353/wsq.2011.0030. On media images of Michelle Obama. Pastan, Amy (2008). First Ladies. London: DK. ISBN 9780789473981. Heavily illustrated. Schwartz, Marie Jenkins. Ties That Bound: Founding First Ladies and Slaves (U of Chicago Press, 2017), 420 pp. Troy, Gil (1997). Affairs of State The Rise and Rejection of the Presidential Couple Since World War II. By a leading political historian. Watson, Robert P. (2003). "Toward the Study of the First Lady: The State of Scholarship". Presidential Studies Quarterly. 33 (2): 423–441. doi:10.1111/j.1741-5705.2003.tb00038.x.